Spooky, amusing, and weirdly moving, "Paved Paradise: The Songs of Joni Mitchell" is either the gentlest sendup or the sharpest hommage you'll ever see. Performance artist John Kelly doesn't so much impersonate Mitchell as channel her, and he does it with a blend of affection and discernment that is remarkable to behold. A few audience members at the Boston Center for the Arts, where the Theater Offensive is presenting Kelly's show this weekend as part of its Out on the Edge Festival, may go in expecting your basic drag act. At first Kelly plays to that expectation - he's wearing a wig and a dress, after all, and he exaggerates the mannerisms of his subject (the prayerful hands, the rubbery grin) with the fond mockery you'd expect from a guy who honed this act at Wigstock in the fabulous 1980s. 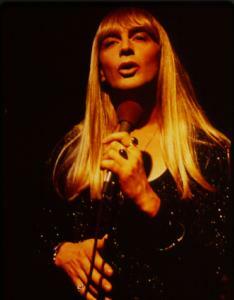 But things quickly turn more interesting, even before "Joni" introduces her band: bassist Vincent Van Gogh (Blake Newman) and, on keyboard, a pigtailed Georgia O'Keeffe (Zecca Esquibel). Near the end of the first song, "Conversation," Kelly's lovely, eerie countertenor, which he's been using to deliver a spot-on Mitchell imitation, suddenly swoops down and in some mysterious way, turns masculine - just for an instant, but it's enough to smash the illusion that we're watching Joni Mitchell in concert and, in the same instant, make us notice how expertly Kelly had cast that spell. It's not easy to say how he does it. His face doesn't really resemble Mitchell's, and he doesn't use heavy makeup to exaggerate whatever resemblance there is. He achieves the effect more through gesture, expression, and tone of voice - oh, I know: It's called acting. That shouldn't be surprising, for Kelly is a gifted actor as well as a dancer, singer, and visual artist. (Local audiences may remember him from "Orpheus X" and "Dido, Queen of Carthage" at the American Repertory Theatre.) But subtle acting is not what people expect in a "drag show," and that may be one reason Kelly resists that label for what he does. Another reason may be that the dress is the least important part of his performance. Where more traditional drag reinforces and exaggerates the conventions of gender difference, Kelly transcends them. He's not particularly focusing on Mitchell's gender in his portrayal; it's not her femininity (whatever that means) but her spirit, specifically as she expresses it in her music, that interests him. And that spirit, as Kelly evokes it, is a fascinating blend of foolishness and wisdom, an aura of goofy enlightenment that will produce a patchouli-and-clove-scented haze of nostalgia around anyone who heard these songs when they first came out. If we laugh at his evocation of two of Mitchell's many personae - the groovy hippie troubadour and the ultracool Hollywood chick - we are also laughing at how our younger selves longed to be as groovy, as cool, as worldly and wide-eyed as she. But we're also celebrating all that. For some of us, who weren't as obsessed as Kelly (like many others) clearly is, 90 minutes of Mitchell may be all we'll need for a while. (Or even, as I sighed to myself during one of the longer longueurs of "Slouching Towards Bethlehem," more than we need.) What's surprising, and wonderful, is how much we do need it, and how much it gains from this strange and shape-shifting form. There's a moment at the end of the show, which I don't want to spoil by describing it, when Kelly's transformation takes a final, surprising, but absolutely appropriate twist. Then, as in the earlier surreal "Circle Game" singalong, encouraged by a swaying and beatific Georgia O'Keeffe, it feels as if there's really only one word for the way Kelly plays with a famous, complicated persona and with our own ideas of the person behind that mask. It's genius. Music and lyrics by Joni Mitchell, book by Kelly from transcriptions of performance banter, interviews, and "interpolations"